Check out this beautiful home on 40 acres located just outside of Tomahawk! This 3 bedroom, 3 bath home sits amongst towering hard maple and other mixed hardwoods. Watch the deer come in from large living room windows as you soak in the heat from the wood burning, stone fireplace. The home has been extensively remodeled and includes newer roof shingles, insulation, and siding on the outside and new windows, furnaces (LP and Wood! ), central air, hickory cabinets in the kitchen, bathroom fixtures, and newer appliances and light fixtures. The two upstairs bedrooms and vaulted ceilings and each bedroom has its own deck to enjoy the fantastic views of the surrounding forest. The property includes a large 2 car garage with upper level storage as well as a shed perfect for split wood for the fireplace and furnace! 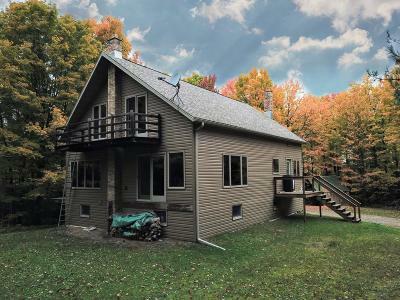 Located just outside of town and a couple minutes from the Spirit Flowage, this up north paradise is just what you have been looking for!